Although you may know Mark Twain (aka. Samuel Langhorne Clemens, or just Clemens for short) primarily as the author of The Adventures of Tom Sawyer and The Adventures of Huckleberry Finn, this all-important American author also penned a strange tale entitled Pudd’nhead Wilson (Wikipedia article). Anyone who attempts to read this story should use a version with footnotes and a solid introduction – my copy is from the Oxford World Classic series and was immensely helpful in providing background. 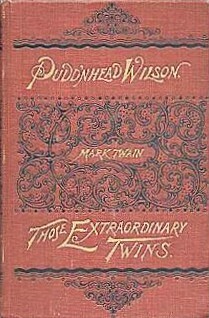 This story was originally written in 1894 and called The Tragedy of Pudd’nhead Wilson and the Comedy of Those Extraordinary Twins (Mark Twain in his Times). I refer to the story as ‘strange’ because despite the title, the character of Tom/Valet de Chambers comes to the fore for most of the book; the lawyer which the town refers to as a nitwit (Pudd’nhead) seems almost a side character; and the entire tale began as a part of Twain’s fascination with conjoined Siamese twins (Mark Twain in his Times). References to his original story about these conjoined twins are imperfectly edited out of the final version. Despite the occasional odds element to this novel, I thoroughly enjoyed the Shakespearean intrigue generated by babies switched at birth, noble vanities, and family betrayal. A good read for a brain in need of diversion!